The tiny islands of Trinidad and Tobago are home to picture-perfect beaches, lush tropical jungles, and lively cities. The home of both calypso and the limbo, the sound of steel-pan drums carries through the hot and humid air while travellers from all over the world relax and enjoy the Caribbean paradise. First inhabited by Arawak and Carbi people from South America, and later introduced to the Western world by Christopher Columbus, Trinidad and Tobago are the southernmost islands of the Caribbean. The islands were passed around by colonialists who built cocoa plantations and imported immigrant labour from Africa, Europe, and India; their descendents make up the diverse population in Trinidad and Tobago today. The capital city of Port of Spain is perhaps best known for the raucous carnival held every spring, with music, dancing, parades, and colourful costumes whirling through the streets of the town for five days. Scarborough is less well-known, but a popular port of call for cruises in the Caribbean. Two days are said to be sufficient to take in the sights and shops of the cities, but an eternity isn't long enough to enjoy the blissful relaxation of the beaches in Trinidad and Tobago. Active pursuits like scuba diving, snorkelling, sailing, hiking, golf, and bird watching are popular, as are less strenuous activities such as lazing in a hammock or sunning on the beach. A holiday in Trinidad and Tobago is a great way to soak up sun and culture in the Caribbean, and perfect for escaping the winter blues of the Northern Hemisphere's coldest months. 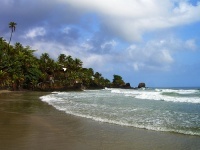 The winter months of December to April are considered the best time to visit Trinidad and Tobago. The rainy season in Trinidad and Tobago is from June to December, and this is the low season. The climate in Trinidad and Tobago is tropical, with hot and humid conditions all year long. The winter months are slightly cooler than the average maximum temperature of 89°F (32°C). Read more on Trinidad and Tobago's Climate and Weather. -Go bird watching at Asa Wright Nature Centre. -Laze in the sun at Pigeon Point Beach. -Get a panoramic view of Port of Spain from the Laventille Hills. -Join the wild, colourful party at Carnival. -Take a romantic sunset boat cruise in Englishman's Bay. -Play golf at the PGA-designed Tobago Plantations Golf and Country Club. -Go scuba-diving at one of 50 top dive sites. Getting to Trinidad and Tobago is fairly easy, as there are direct flights to Trinidad and Tobago from London, landing at Crown Point. Indirect flights to Port of Spain are also available. Direct flights to Trinidad and Tobago from the US are also available on several airlines, from cities like Miami, Fort Lauderdale, New York City, and Houston. Get more information on Trinidad and Tobago Airports. The Dragon Can't Dance by Earl Lovelace. Coconut water and puncheon rum. Sunblock and a hat - Trinidad and Tobago are near the equator and the average temperature can reach 88°F (31°C). Port of Spain comes alive with colour and music during the carnival, held each spring. -Tobago is believed to be the place Robert Louis Stevenson had in mind when he wrote Treasure Island. -The Limbo was invented in Trinidad and Tobago. -Main Ridge Forest Reserve on Tobago is the oldest protected rainforest in the Western Hemisphere. A paradise of swaying palm trees and lively parties, a holiday in Trinidad and Tobago is the perfect Caribbean getaway.